“THE MAN, WHO EATS HONEY AND BEE POLLEN, HARDLY EVER HEARD THE WORD “IMPOTENCE”. According to the ancient Greeks, the gods of Olympus were immortal – because they ate ambrosia and drank – nectar. 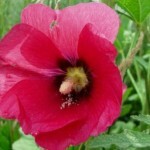 In the works of Homer it can be read: the nectar is red and looks like a wine. They drank it by mixing with water. It was believed that the constant use of nectar gave immortality, to weak ones – force. People still do not know the taste of nectar, although they knew that it is collected by a myriad of insects, and that the collected nectar of flowers turns into a honey. We also know that most of the plants have nectar, contained in the form of microscopic droplets, and therefore it is very difficult to collect. And what is Ambrosia? In ancient Greece, the word “ambrosia” meant the product, giving if not immortality, then, in any case, health and longevity. In ancient literature the term “ambrosia” is usually associated with nectar, and so this product was derived from the flowers, and it had medicinal substances. Obviously, this product is honey. Maybe it is the “food of the gods”? 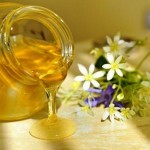 In ancient times, honey was considered as the main means of healing and has been used for therapeutic feeding. The great Greek – mathematician Pythagoras, the father of medicine Hippocrates and the famous Roman physician Galen told about it. 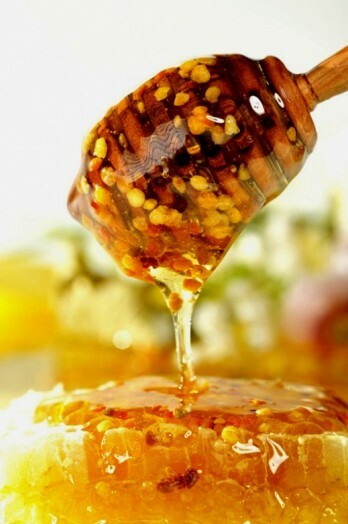 Honey with wine, milk, fruits, nuts, poppy seeds was used in food, honey and olive oil were rubbed into the skin. Avicenna (Ibn Sina) left to posterity two hundred recipes of medicines made from honey, and in the ancient Indian “Book of Life” was written that milk and honey can extend human life to 500 years! 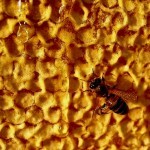 The honey is an excellent antiseptic, too, it has been known since ancient times. According to legend, the commander Ptolemy brought safely from Babylon the dead body of Alexander the Great, plunging it into a bath of honey. If in the morning, half an hour before breakfast, eat 1 teaspoon of honeycomb – it is enough to heal many chronic illnesses, to restore good health. The systematic use of honey and bee pollen has particularly beneficial effect on the nervous system, digestion, immunity and heals a number of infectious diseases. 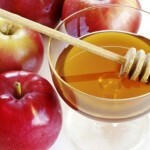 It is better to give honey to children with other foods, such as cereal, fruit or tea, so honey is better absorbed. It is enough one teaspoon of honey a day for a child. 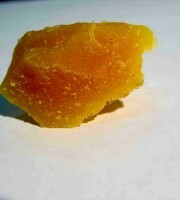 Some babies hardly digest sucrose, but honey well. Fructose, contained in it, is absorbed better than breast milk lactose. Children who eat honey and bee pollen, have healthy digestive tract, increasing appetite, they develop better and grow faster. Some varieties of this product have a calming effect on the nervous system, and the children quickly and easily fall asleep after taking it in food. Modern science has discovered that the pollen contains an amazing amount of nutrients – almost all of the known essential elements of food in a concentrated form. The content of amino acids in flower and bee pollen (bee bread) is bigger than in the beef, eggs and cheese (100 g of pollen corresponds 500 g beef or 7 eggs). According to experts, pollen and bee bread are able to satisfy the body’s need for protein and most minerals. There were 200 people, aged over 100 years. They were sent letters, asking them to answer three questions: How old are you, how you earned a living, and that, in general, you eat. It was received 150 responses. It was made a very interesting discovery. The responses showed that a significant proportion of centenarians were beekeepers. But all of them, without exception, reported that their main food has always been sediments of honey at the bottom of the hive! 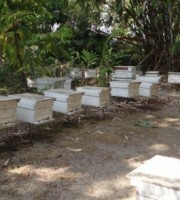 They were poor and sold all pure honey on the market, leaving only the residue for themselves. 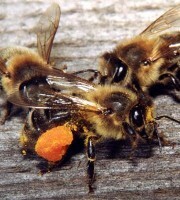 Many healers believe that honey and bee pollen is the unique in its healing effects tool. Week and a half of receiving pollen is literally transforming the people. Fatigue and lethargy disappear. Flexibility of mind and initiative increase, they better understand books.This mild action of the pollen can not be compared with the stimulating effect of alcohol, coffee and tobacco, that can only for a short time lead a man out of a depressed state. Varices smooth, as walls of the veins are restored, the structure of which was destroyed by penetrating of single-celled parasites. Blood pressure in hypertension lowers . 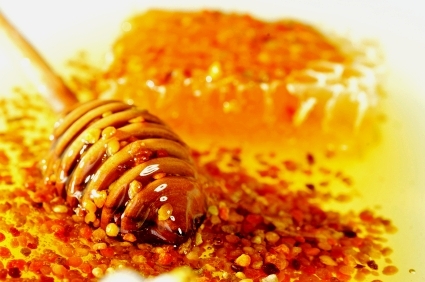 Therefore, it is indispensable for cholecystitis, stomach ulcers, heart diseases, diabetes (mixed with honey), impotence. Incidentally, Charlie Chaplin, the famous English comedian and film director, famous for his sexual adventures and powerful amorous ardor once dropped a curious phrase: ” The man, who has the buffet, which has brandy, honey and pollen, hardly ever heard the word “impotence”. Bee pollen improves the body’s defenses of malnourished, debilitated patients, promotes healing, reduces inflammation, improves the health of patients, improves sleep and normalize appetite. One of the secrets of physical and political longevity of U.S. President Ronald Reagan was the bee pollen. Every morning, Reagan ate a small amount of honey mixed with pollen, spreading it on bread or loaf. According to the memoirs of contemporaries, Reagan always was remarkable for his uncommon energy and optimism. There is no doubt that the honey, and especially bee pollen have been one of the main reasons of always excellent health and good mood of this famous American. Pollen provides energy, stamina, and so it is used by a high percentage of long-distance runners, athletes, boxers (Mohamed Ali, George Foreman and other legends of boxing). Studying the composition of the pollen, the researchers were delighted. It turns out that it contains almost all the minerals that make up the blood. Microelement meshes of blood and pollen almost coincided one to one! The treatment of anemia (especially in children) with the bee pollen gives a very rapid increase in the number of red blood cells and white blood cells in the blood, increasing the hemoglobin, overall, the mood. 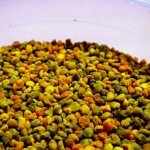 Eating of the bee pollen mixed with honey gives a very positive effect on coronary heart disease. Pollen is very effective as a means of anti-sclerotic. It normalizes the lipid composition of the blood. Compared with medications that have side effects, the pollen is out of competition. Highly valuable feature of the pollen is that it has a high therapeutic effect in disorders of the gastrointestinal tract. 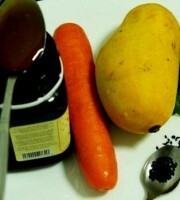 It has successfully treated many stomach ulcer and duodenal ulcer. 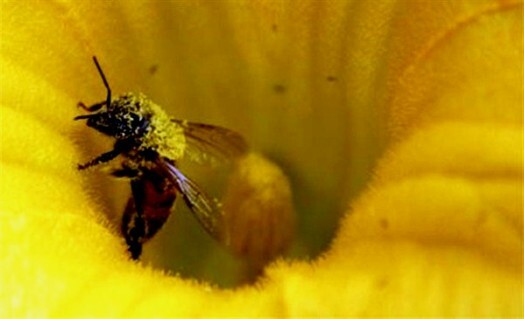 In pollen was found a particular antibiotic substance that has the property to stop the development of bacteria such as salmonella, which is difficult to destroy. Thus, the pollen is a regulator of intestinal flora: suppressing the activity of pathogenic microbes, it contributes to the development of useful ones. 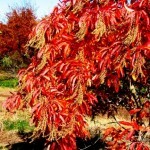 Affecting the metabolism, pollen stimulates all body functions. It replaces all traditionally used tonic, cures most persistent constipation and diarrhea, and helps with enterocolitis and other functional bowel lesions. It is well known how difficult it is to treat chronic lung disease. Pollen reduces inflammation in the lungs, improving the blood, reducing the ESR and leukocytosis. The presence in the pollen of large amounts of vitamins, fatty acids and bioflavonoids has great impact on the body’s ability to neutralize the toxin, getting into it. Pollen, increases the therapeutic effect of pharmacological drugs and simultaneously reduce their toxicity and reduces or even completely eliminates the side effects. Pollen is a valuable natural medicine for the treatment of prostatitis, hypertrophy and BPH. It quickly relieves pain and normalizes the condition of patients. In recent years, scientists discovered the radioprotective effect of pollen and honey. Suppressing the formation of free radicals, they help the body’s production of anti-cancer immunity. Pollen is used as an aid in the treatment of cancer, can increase the likelihood of recovery. They have very beneficial effect on children, especially the retarded ones and suffering from anemia and rickets. It can be much more written about the wonderful properties of pollen and honey. And more about completely unexplored, but used in practice methods of using the pollen in the treatment of various diseases. In any case, when you suddenly have not very successful day, think about the bee pollen and honey… And you’ll feel better soon!